Thomas Nast ranks as one of the most successful, powerful, and prolific artists of the 19th century, and is a name linked closely to one of the most successful, powerful, and prolific newspapers of the 19th century. Through their successes, both Nast and Harper’s Weekly gained sufficient power to influence American politics in the second half of the 19th century and help shape the political climate of America during the industrial revolution. Thomas Nast was German born, moving to America in 1846. Skilled as an artist, he first went to work for Frank Leslie’s Illustrated Newspaper in 1859, but within 3 years he began working for its competitor, Harper’s Weekly. His work continued to appear in Harper’s thru 1886. It was a symbiotic relationship for the two. Circulation of Harper’s Weekly grew as Nast drawings were found in more and more of its pages, and Nast‘s notoriety and popularity grew in large part to the increased circulation of Harper’s Weekly. Nast‘s powerful pen in support of the prosecution of the Civil War was honored by President Lincoln when he called Nast “our best recruiting sergeant”. With original artwork by Thomas Nast commanding prices far beyond the pocketbooks of most collectors, prints found in Harper’s–and only in Harper’s–remain a popular way to assemble a collection of this famed artist’s work at relatively low prices given the current availability of genuine issues. 1) His portrayal of battles & events of the Civil War, which often featured human interest themes & the effect of the war on those back home, remain as some of the best and most heart-felt scenes of the Civil War. Daily newspapers only provided written text; Harper’s Weekly and the prints of Thomas Nast provided a visual representation of the reality of war. 2) Perhaps most noticed as a political cartoonist, his work did much to expose the graft and corruption of William “Boss” Tweed, the powerful Tammany Hall political machine of New York City. In fact it was a Nast cartoon which caused Tweed to be arrested following his escape from jail and flight to Spain. A customs official recognized him from his many appearances in “Harper’s Weekly”. Nast has been credited with doing much to cause elections of all in the hands of those he supported (Grant’s two Presidencies), and cause to fail those he disliked. 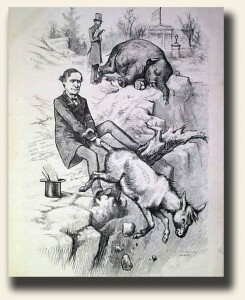 It was Nast who created the caricatures of the Democratic donkey and the Republican elephant to represent those parties, political icons which remain to this day. Desired among collectors are the first donkey to appear in the pages of Harper’s Weekly (January 15, 1870) and the first elephant to appear (November 7, 1874), as well as the first time they appeared together (December 27, 1879). All three command premium prices due to their desirability, but collectors are encouraged by the inexpensive prices for other genuine issues of Harper’s which include Nast illustrations of both. 3) Santa Claus prints. It is Thomas Nast who is credited with creating the modern version of Santa Claus, the jolly, rosy-cheeked, rotund purveyor of gifts in the uniform as we know him today. Nast’s first Santa Claus to appear in Harper’s Weekly was titled “Santa Claus in Camp” from during the Civil War, appearing on the front page of the January 3, 1863 issue. Yet it is the January 1, 1881 issue which has the Santa Claus centerfold which still appears in many Christmas advertisements and is perhaps his most famous rendition. 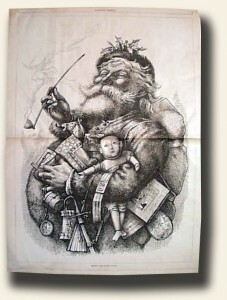 There are many issues of Harper’s Weekly which have Santa Claus prints, all very desired among collectors. True to any symbiotic relationship, with Nast leaving Harper’s Weekly at the end of 1886, he lost his forum to reach the masses, and in losing Nast, Harper’s Weekly lost its political importance. Nast continued his work in other publications, none being very successful, until his death in 1902 to yellow fever. Harper’s Weekly never regained its success from the Nast years, and it ultimately ceased publication in 1916. Harper’s Weekly issues with Nast prints are very displayable, particularly those which feature Nast images on the front page, or notable icons such as popular politicians, Santa Claus, Uncle Sam and Abraham Lincoln. A very famous Nast cartoon featuring Lincoln is the “Long Abraham Lincoln A Little Longer” cartoon which is in the November 26, 1864 issue, signifying his successful second Presidential election. All issues offered by Hughes Rare & Early Newspapers are genuine & complete in 16 pages, save for a few described otherwise. In many cases two or three Nast prints appear in one issue.